Amazon.com description: Product Description: #1 NEW YORK TIMES BESTSELLER â¢ Pulitzer Prizeâwinning author Jon Meacham helps us understand the present moment in American politics and life by looking back at critical times in our history when hope overcame division and fear. 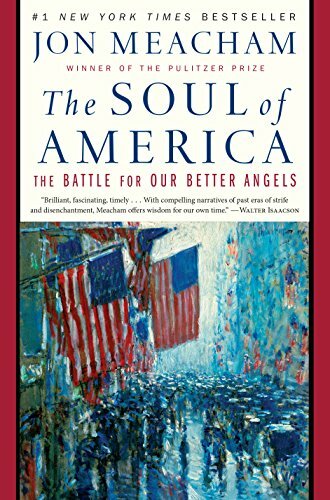 Our current climate of partisan fury is not new, and in The Soul of America Meacham shows us how what Abraham Lincoln called the âbetter angels of our natureâ have repeatedly won the day. Painting surprising portraits of Lincoln and other presidents, including Ulysses S. Grant, Theodore Roosevelt, Woodrow Wilson, Franklin D. Roosevelt, Harry S. Truman, Dwight Eisenhower, and Lyndon B. Johnson, and illuminating the courage of such influential citizen activists as Martin Luther King, Jr., early suffragettes Alice Paul and Carrie Chapman Catt, civil rights pioneers Rosa Parks and John Lewis, First Lady Eleanor Roosevelt, and Army-McCarthy hearings lawyer Joseph N. Welch, Meacham brings vividly to life turning points in American history. He writes about the Civil War, Reconstruction, and the birth of the Lost Cause; the backlash against immigrants in the First World War and the resurgence of the Ku Klux Klan in the 1920s; the fight for womenâs rights; the demagoguery of Huey Long and Father Coughlin and the isolationist work of America First in the years before World War II; the anti-Communist witch-hunts led by Senator Joseph McCarthy; and Lyndon Johnsonâs crusade against Jim Crow. Each of these dramatic hours in our national life have been shaped by the contest to lead the country to look forward rather than back, to assert hope over fearâa struggle that continues even now. While the American story has not alwaysâor even oftenâbeen heroic, we have been sustained by a belief in progress even in the gloomiest of times. In this inspiring book, Meacham reassures us,Â âThe good news is that we have come through such darkness beforeââas, time and again, Lincolnâs better angels have found a way to prevail.